Je t'adorn: My Bead Soup Product! Oh Carol!! It is absolutely BREATHTAKING!!!! I can't wait to show it to the girls at the shop and to Glen!!! Stunning work! I wish I knew how to do peyote! That may be my "learn it before the year end" goal!! Great job!!! LOVE IT! Very nicely done. Love the color choices for the free-form bead work. Well, that makes us even, Candi. I was very impressed with your wire work and your design sense with what you did with what I sent you and it is good to hear you like mine, too. I love combining techniques and find it is useful to be somewhat proficient in more than one. Peyote is not hard and is great for bails, for one thing. This freeform is fun since you don't have a pattern...you just go. And any mistakes (I made a few) don't even show. Did Glenn use copper PMC for the focal? Or is it cast copper? Or what? It is very pretty and everyone liked it. 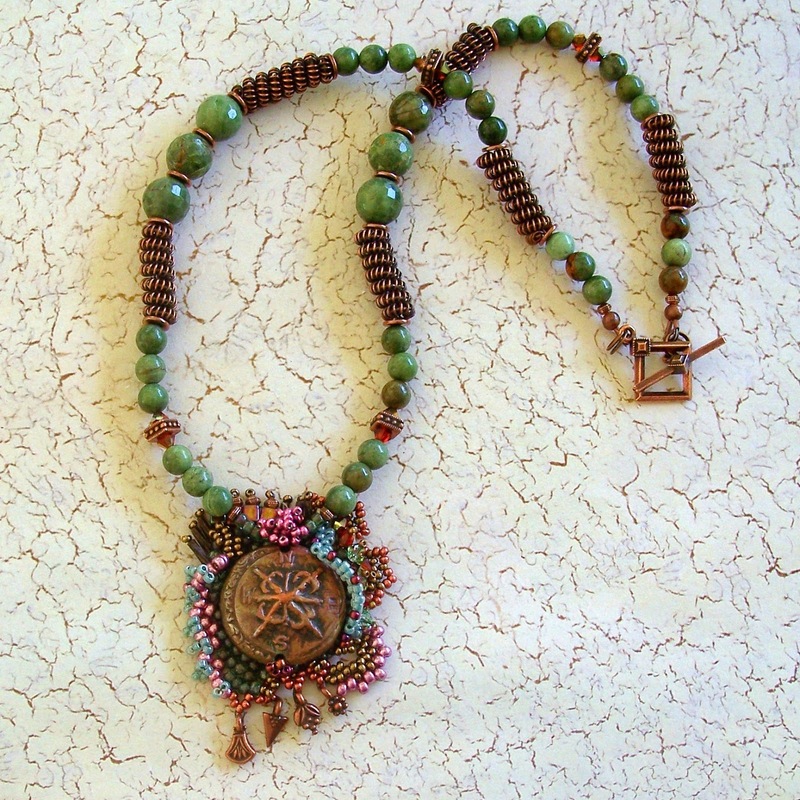 Love your copper coil beads and your free form peyote is glorious!! great use of an awesome soup!! Great Necklace!! The colours work very well!! Well done!! NIce job! Love the bead work. The freeform beadweaving really suits that focal! Nicely done. Very nice bead embroidery. Not to mention a very cool finished product. I need to try more things with the free form peyote. Thank you for the inspiration. Wow, great piece! Looks very nautical to me! 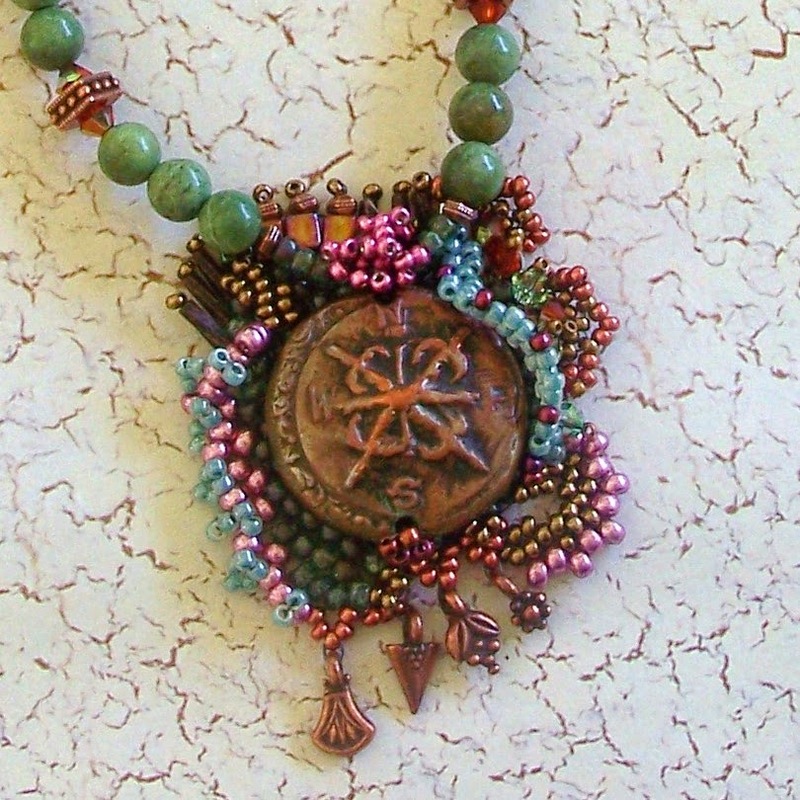 Love the bead work and your copper coil beads....Great job! Thanks for joining and posting! Love your necklace - the focal is amazing. The colours and the design complement each other so well. The wire coil and the green beads go so well together. Beautiful work! What a joyful and vivid composition - lovely soup, Carol! I love how you used the spacers between green opal beads, so cool! What a fun piece. I love free-form. Nice job. What a beautiful necklace! Great work. Lovely necklace, very unique treatment of the focal. freeform beading- I love it! necklace is really great! Beautiful! I like the way you combine freeform style with the geometric parts. I love freeform weaving, it's my main beading passion. I love this and love how you combined it with stringing. How beautiful! I love the freeform work! ...Also you have the best blog name ever. Just sayin'. Wow. The beadwork with the focal is incredible. The freeform peyote give the focal such an interesting feel - well done! Your beadwork is incredible and I love the colors that you put together. You are an incredible artist. I can only wish. Beautiful colors and combinations. This is such a pretty piece! Great colors in the beadwork around that focal. The necklace is beautiful. Nice job! I don't see free form weaving very often, and I like it, admiring you as a seed beader very much, you must have so much patience! Thank you all for the lovely comments! As for patience...when you love it, times passes and you don't even notice! The freeform framing of the focal is amazing! Also the use of wire coiled beads is an interesting alternative to ready made spacers, this made the chain look like a necklace by itself! Great color combo and contrast colors - I wouldn't dare combine green and blue in these particular hues but the effect is gorgeous! I can't even say why I paired the green and blue. It just seemed right at the time. What a really intriguing design. There's so much texture and the design really makes you want to lean in to see all the detail you included. Nicely done! Love this, it looks like an antique map piece with the compass rose!